DANANG, VIETNAM - Trade ministers from 11 Pacific Rim countries announced an agreement Saturday on pushing ahead with a free-trade deal whose destiny was uncertain after U.S. President Donald Trump dropped it. “We have reached an agreement on a number of fundamental parts,” Vietnam’s trade minister, Tran Tuan Anh, told reporters in the coastal resort city of Danang, on the sidelines of the Asia-Pacific Economic Cooperation forum. 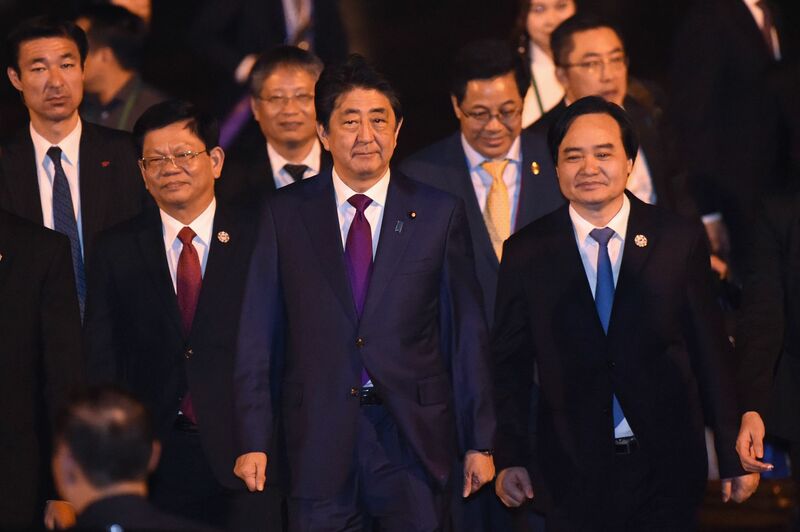 But more work must be done before leaders of the countries involved can endorse the plan, said Anh and his Japanese counterpart, Toshimitsu Motegi. The 11 counties remaining in the trade pact rejected by Trump in January have been working to revise the deal to allow them to proceed without U.S. involvement. That involved a difficult balance between maintaining high standards and pragmatism, Motegi said. “Through a pragmatic response of the officials involved we could come to an agreement,” Motegi said. He said it was clear there would be a need for further changes but that differences had been narrowed down. The extended negotiations resulted in an even longer name for the trade pact than originally devised. It is now the Comprehensive and Progressive Agreement for Trans-Pacific Partnership. The new pact, after changes were made to the original TPP text, can take force 60 days after at least six signatories complete domestic procedures. In coming to the agreement, the 11 countries reached a consensus on suspending 20 clauses in the original text — assuming Washington stays out of the pact — including 11 on intellectual property. 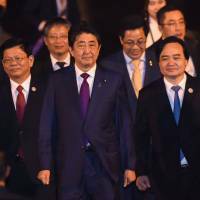 Japan had been hoping the leaders of so-called TPP 11 would back the deal on the sidelines of APEC, but Canada’s unexpected move led to the cancellation of the leaders’ meeting set for Friday afternoon. The summit was set to end on Saturday. Canadian Prime Minister Justin Trudeau skipped the meeting after holding talks with Prime Minister Shinzo Abe on Friday. Abe said Canada “was not at a stage to confirm the agreement” that was reached at the ministerial level. “We’re making progress on the TPP — and working hard to make sure we get the right deal for Canadians & Canadian businesses,” Trudeau said in a Tweet following his talks with Abe. “We will only sign onto a deal that reflects Canada’s interests and meets our objectives to create and sustain well-paying middle class jobs in today’s competitive global economy,” he said in a statement. “Canada did agree, and that means the ‘top’ also agreed,” he said. Trudeau had said days earlier that Canada would not be rushed into an agreement. Champagne defended the delay, echoing Trudeau in saying he would not be rushed. The frictions in talks — which saw the chief Vietnamese trade negotiator walk out late Thursday night in frustration — had raised concerns the deal, which took years to negotiate, might collapse entirely. “What we’ve been able to achieve is to preserve market access in Japan, we’ve been able to improve the progressive elements and we’ve also been able to suspend key sections like intellectual property which our Canadian stakeholders thought would have an impact on innovation,” Champagne said late Friday in an interview in Vietnam. The TPP, which would have covered 40 percent of the global economy, was thrown into disarray when Trump withdrew the U.S. in one of his first acts as president due to a perceived risk to American jobs, leaving other countries scrambling to keep the deal alive. Discussions in Vietnam centered around suspending some parts of the agreement in a bid to move forward without America’s involvement.The trade deal was seen as a hallmark of U.S. engagement with Asia under the prior administration and a buffer against China’s rising clout. Then-Defense Secretary Ash Carter called it more strategically important than having another aircraft carrier battle group in the Pacific. It would go beyond traditional deals by including issues like intellectual property, state-owned enterprises and labor rights. Despite enthusiasm for sticking with the plan following the U.S. withdrawal, criticism over various issues persists. Detractors say it favors corporate interests over labor and other rights. Aspects of the trade pact have also raised hackles over a requirement that companies be allowed to sue governments for lack of enforcement of related laws. Trump reiterated his markedly different stance on trade before the 21-member APEC summit convened Friday with a gala banquet. Trump said he would not enter into large trade deals, alluding to U.S. involvement in the North American Free Trade Agreement and the TPP. Xi drew loud applause when he urged support for the “multilateral trading regime” and progress toward a free-trade zone in the Asia-Pacific. China is not part of the TPP. APEC operates by consensus and customarily issues nonbinding statements. TPP commitments are to be eventually be ratified and enforced by its members. But even talks last week on a declaration to cap the APEC summit had to be extended for an extra half day as ministers haggled over wording. The release of a set of ministerial agreements early Saturday suggested the leaders would finesse any disagreements, as usual, to demonstrate unity and avoid embarrassing their hosts.